and out of the mailbox... along with heart butterflies. The border was made from large pink strips of construction paper and red hearts. using glitter and glue. Then children added stickers and foam shapes to decorate their envelopes. 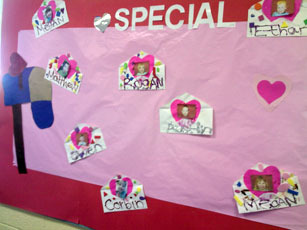 child decorated heart cutouts to complete the display. Invite parents to participate in your holiday parties with this display. 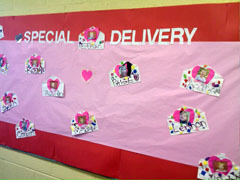 board to see what items parents will be sending. one heart and place it in the bag. Keep the other heart as a reminder. Send them item on the date listed. Thank You! a cupid and place at the top. Label the heart at the top of the day, "Enter With Love". red or pink, use white paint, if white paper, use red and/or pink paint. Rachel loves Aunt Sarah) and add these randomly over the painted paper. eyelashes, lipstick, arms, legs, funny hats, and so on, then cut them out. Because of all the things you do! Would you, could you, please be mine? 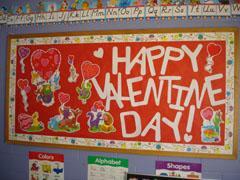 the board for a Valentine's display. Then allow the children to take home their Valentine's. The Sweethearts of Room ___! 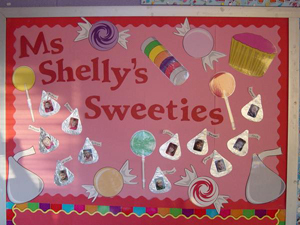 This bulletin board can be a perfect place to show off your class. them number their papers and write in who they think each person is. director, principal, other teachers, and don't forget yourself. The children will love to see you as a baby. cutout with aluminum foil. Then we attached a photo of each child onto a Hershey Kiss! picture to the bottom of a cupcake liner, then glue the liner to the heart. Write each child's name below their picture. Then mount the title Miss _________'s Sweeties. Tape a length of bulletin board paper to the floor of an uncarpeted area. "I Love You from my head to my toes. Happy Valentine's Day!" I Love You From the Bottom of My Sole. Give each child an 8 inch square of white construction paper. the heart to a white background on a wall or a bulletin board. Write the words "We Love You" above the heart. Heart" around the outside of their red heart (on the white paper). to a piece of white butcher paper. 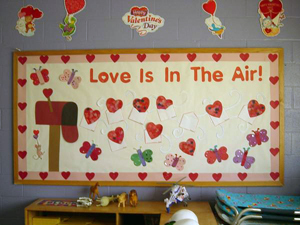 Then hang the heart on the wall or bulletin board. Will "Zoo" be my Valentine?